Last night Rick was ironing a shirt while Zack was in the tub. When he came back into the bathroom, there was water EVERYWHERE. Rick asked, "Who did this?" Zack answered, "It wasn't me!" Rick looked around and saw our cat. He asked, "Did Buddy do it?" Zack nodded solemnly. "Buddy came into the tub." Rick looked at the cat. "But Buddy's not wet." Zack explained, "He's wet on the inside". I saw this on another blog and thought I'd share it! I love it -- it reminds me of the stop-action films we made in art class in 7th grade, but waaaaaaaay cooler and more creative. And I LOVE the music. Last night my throat started hurting and I thought, "Oh great, here comes strep." Rick volunteered to call the doctor right when they opened for Saturday hours and get me an appointment, so I didn't have to get out of bed and earlier than necessary. He woke me up with JUST the right amount of time to take a shower and drive 25 minutes to the doctor's office. When I got out of the shower, he was standing there with a cup of Ghiradelli hot cocoa for me. The good stuff, made with milk, not water. When I got home (strep test negative, but meds anyway), I really wanted to just fall in bed and hopefully sleep it off. He'd made the bed up with fresh, clean sheets. Nothing quite as great as clean sheets, you know? Then he took Zack out for an "adventure" so the house would be quiet and I could sleep. And that is one of the many reasons why I love my husband. 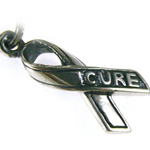 For most of these, I use this diabetes awareness charm, which has DIABETES stamped on one side, and CURE stamped on the other. 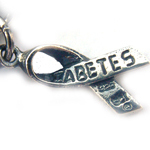 I also do custom work for Juvenile Diabetes bracelets, and I also stock round medic alert charms that are engravable -- you can switch out the ribbon charm and add the medic alert charm for an additional cost of $10.00 to your bracelet, and have it engraved at your local jeweler. I just realized -- my last post was Post #500! Wow! A neat but useless factoid! As with most of Anita Shreve's book, the heroine is a quietly tragic figure. Shreve's way with words is great, but oh how I wish one day that the main character would just reach out and SLAP the heck out of someone -- in this book, particularly when she meets the second wife. But then, it wouldn't be an Anita Shreve book if that happened. But it would be immensely satisfying. 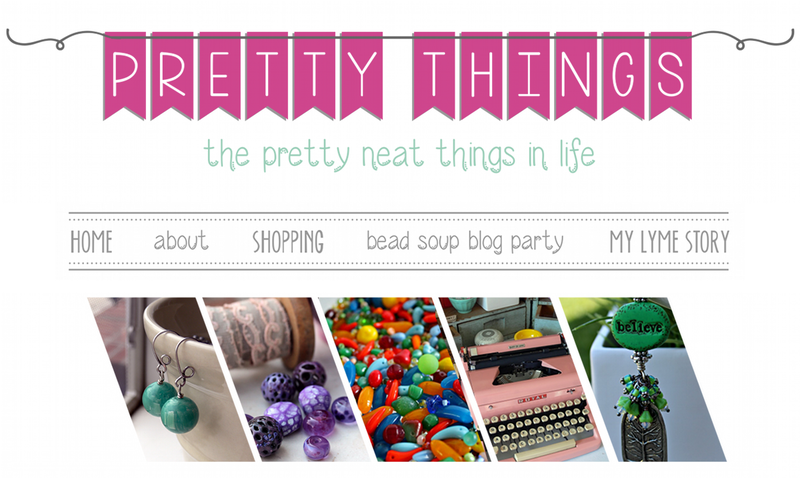 My friend Amy makes fun, affordable jewelry that is definitely on the whimsical side. She does a lot of the same shows I do, and I am so glad to have met her. Her booth is amazing, too -- lots of fun and very cute! 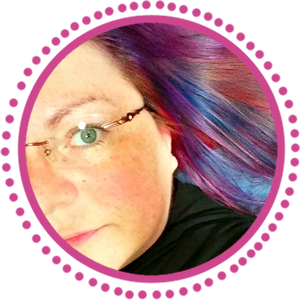 She specializes in funky bracelets and necklaces, some with the most unusual "beads" ever -- plastic Ninja men and rubber chickens, among others! She just debuted her Rubber Chicken Earrings this past show, and I had to share. They would be a wild addition to a Christmas stocking, don't you think? This year I finally read the classic "Atlas Shrugged" by Ayn Rand. 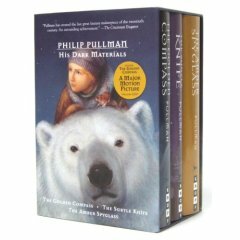 I had the hardback edition, so its over-1000-pages occasionally whacked me in the face when I nodded off reading in bed. I recommend the paperback. Anyway, after reading it, my friend Tara and I had a discussion about who we thought could play Dagny Taggart in a movie. I remember reading in "Hollywood Animal" that years back, when the idea of a movie was being tossed around, Sharon Stone thought she'd be PERFECT for the role (this was right after her "Basic Instinct" success). I'm laughing, as I hope you are, at the thought of Sharon Stone playing that role. I mean, Dagny is a strong, charismatic, smart woman who single-handedly runs a railroad. Give me a break. So, I was reading a magazine and saw that Angelina Jolie is scheduled to play Dagny. OK. Let me think about that for a minute. I think I could see it -- I loved Angelina in "Girl, Interrupted" (one of the few times I liked the movie better than the book), and ok, I can definitely deal with Angelina Jolie rather than Sharon Stone. But it makes me wonder about what would have happened had the movie been cast soon after it was written. Tara and I were tossing around people like Katharine Hepburn for the role. The men were far easier for us to cast with modern actors -- but we were at a loss for a good modern actress. If you read the book, I'd love to know what you think! A quick note because I'm SO tired -- in the middle of a big three-day craft show in Northern Virginia and having a ton of fun but exhausted. I love doing these shows -- seeing vendors I haven't seen since last year, visiting with customers, doing a fair amount of Christmas shopping, too! Rick and Zack are at home, so tonight I went out to dinner with my friend Amy, and tried something new -- Afghani food. REALLY liked it. To me, it was similar but better than Indian food -- savory without the curry, which I've never been fond of. We talked and laughed and it was a welcome adventure! Started a new book -- "Lord John and the Private Matter" by Diana Gabaldon, she of the Outlander series fame. Lord John was a character in the Outlander books, and I don't know if it's because I keep waiting to read about Jamie and Claire, or if I'm trying to read these while too tired, but I'm not getting into this one nearly as much as I expected. I'll keep at it, and try the second one, too, because there's no denying Gabaldon can tell a great story. OMG. 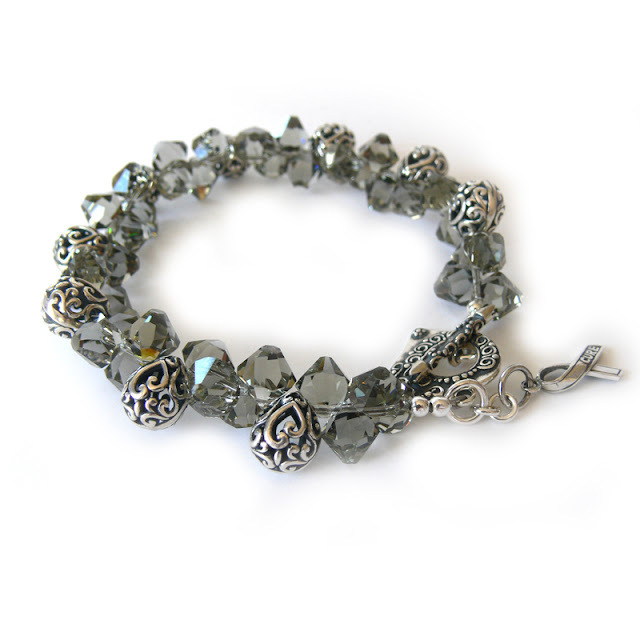 I just got an email from Fire Mountain Gems and the ad they just ran is also going to be in a European bead magazine. That is too cool for words. You know, four years ago when my friend Michelle took me to my first bead store, I had no idea it would turn into the full fledged business that it now is. Have I told you that story? I was about three months pregnant, and had to be put on "modified" bed rest for a bit -- that meant I could sit upright and make the occasional excursion, I couldn't be on my feet more than about an hour a day. When the doctor told me that, we were supposed to be leaving for the beach the next day, to share a house for a week with our friends Rob and Michelle. The doctor said, Yes, by all means, go and relax, but you can't go the beach, you can't get overheated, you can't walk on the boardwalk, etc etc etc. So Michelle took me for a very brief trip about a mile down the road from where we were staying in Kill Devil Hills, NC, I got some beads, and I was hooked. Michelle told me about this cool web site called Fire Mountain Gems that had a huge free catalog full of beads, and I ordered it. When it arrived, I was in heaven. It reminded me of the Sears Wish Book that used to come in the mail when I was a kid, full of toys that I sat for hours poring over. I did the same thing with that bead catalog -- circiling things I wanted, creating lists, and finally, making that first order. If you are a interested in learning how to make jewelry, I'd so recommend getting FMG's catalog or visiting their web site. 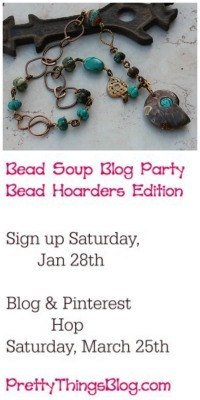 It's full of beads, design ideas, tutorials and tips -- a great way to get started. And if you have any questions, I'm always available by email. If I don't know the answer, I can find you someone who does. Only a few pieces of jewelry to share -- the first is a larimar necklace, along the lines of the Fire Mountain Gems ad that just came out. 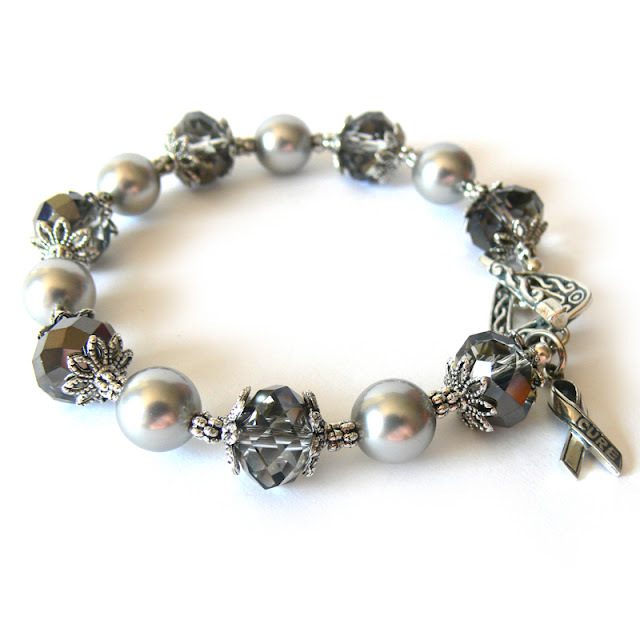 I originally was working on a charm bracelet, and was getting ready to add all the pearls when I laid it down on the table to answer the phone. I looked at it and thought, "Huh. 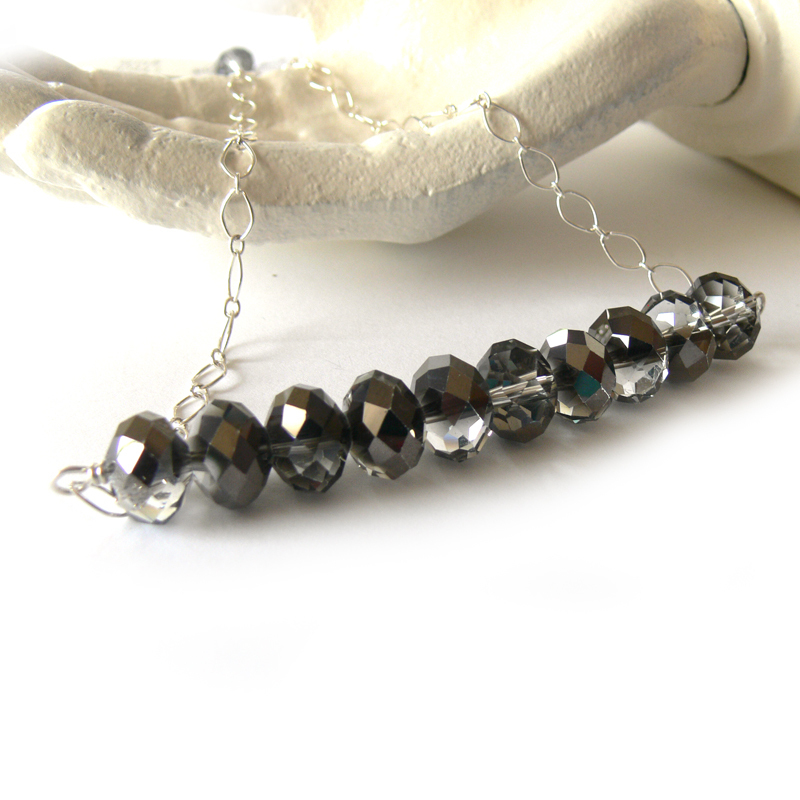 Bracelet, maybe not," and the necklace was born. I think it's safe to say you won't find a larimar necklace like it anywhere else! Well, I finished "A Breath of Snow and Ashes" last night, and of course it was wonderful, but I felt bad that the series was over. BUT guess what I just found out? There will be a Book 7! Woo hoo! I have to wait until the end of 2008 but still, jumpin' woo hoo! I started another book, totally unrelated, called "The Elephant in the Playroom -- Ordinary Parents Write Intimately and Honestly About the Extraordinary Highs and Heartbreaking Lows of Raising Kids with Special Needs" by Denise Brodey. I got this to help me feel not so helpless when Zack's Sensory Integration Disorder gets in the way of his happiness. He's been doing SO much better, but he still gets completely overwhelmed by lots of noise and has a definite circle of personal space that he doesn't like broached by people other than his family. If you have a child with SID, autism, bipolar, cerebral palsy, or similar things, I'd recommend this book. 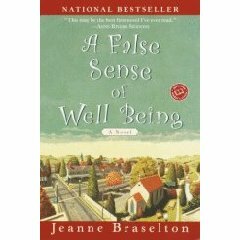 It's not a diagnostic book, but it's a book that will make you feel you're not alone dealing with things. 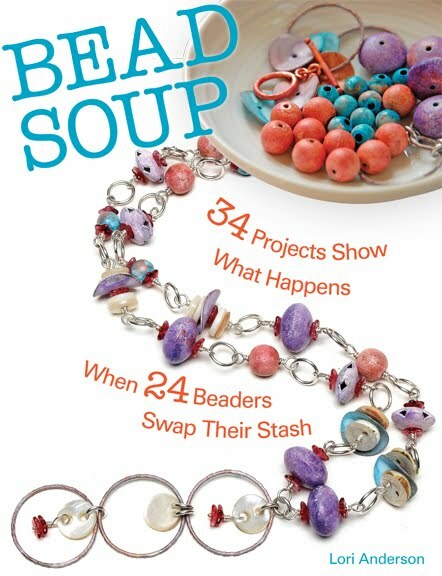 When I was away last weekend, I got an email from someone asking about the necklace on the back of the latest Beadworks magazine. I thought, "Huh?" and went to the nearest Barnes and Noble to check it out. Hey! Fire Mountain Gems featured a necklace I made on the back cover! It's a necklace I made two years ago (they did say it would take some time, LOL!) and it has a happy home. Fire Mountain has another of my necklaces for the same purpose, one that was a finalist in their beading contest, but I have no idea when that will appear. Needless to say, it was a nice surprise! I'm debuting a new display at my next show, a Pendant Tree. Well, technically it should be called a Pendant Tower, because the display is a vintage-esque Eiffel Tower, but for some reason I can't get "tree" out of my head. If you see something you absolutely must have and can't wait to see it on the web site, email me! I can't help it, I get so excited anytime something I do gets recognized. This month's issue of "Taste of the Bay" has a feature about Holiday Gift Picks and my jewelry was included! TOO exciting! If you'd like to see the PDF file of the article (there are a lot of really cool artisans included -- I've got my eye on some purses featured) please send me an email. In the meantime, here's some eye candy to whet your holiday shopping appetite! Visit www.lorianderson.net for more handcrafted jewelry and unique holiday gifts!